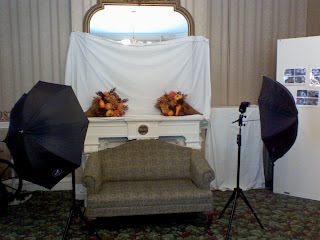 I'm did a photo gig at a nursing home today. I was hired by the facility to do some portaits of the residents and staff. It went pretty well. A little slow at times waiting for the subjects in between sessions, but it's a nursing home, so it was expected! Also, the first session was a no-show! Oh well, I'm paid regardless, so it doesn't matter. It was a good interesting gig. My final session was a portrait shoot of a family with 5 generations. That was pretty cool. p.s. This setup picture was taken with my cell phone.